So I’d like to take us to the next step and talk about how to use docker files. As we do that, we’ll also get our first exposure to how docker handles networking. So let’s jump right in! We saw earlier that when working with images that the primary method for modifying images was to commit your container changes to an image. This works, but it’s a bit clunky since you’re essentially starting a docker container, making changes, exiting out of it, and then committing the changes. What if we could just run a script that would build the image for us? Enter docker files! Note: Docker suggests that all commands are specified in uppercase but it is not required. Interestingly enough, you’ll see later on that the docker file’s name itself (Dockerfile) is case sensitive. FROM – From specifies the base image you’ll use to build your new image. MAINTAINER – Lets you specify the author of the image. RUN – Lets you run a command in the container. After the run completes, the build process will commit the image to the imagestack. This is important to remember and we’ll see an example of this when we run a test later. There are two options for running this command. One where you pass a simple command to docker (this is what I’ll be using) and the other referred to as exec syntax where you run the command and don’t require /bin/sh on the image to use it. CMD – Specifies the command that should be run when a container is built off an image. Recall that when you create a container, you need to tell it what process to run. CMD lets you specify this in the image creation so it doesn’t need to be specified at container runtime. You can only have one CMD per docker file much like you can only have one command ran when you launch a container. EXPOSE – Expose tells the container which ports it should expose to the host the container is running on. For instance, in our example we’ll have two expose statements since our container will host both Apache and a SSH daemon. When we build the container, we tell docker to read the expose commands and only expose those ports. ADD – Copies a file from the docker system into the image. This is useful for copying configuration files as well as any other files you may want to be on the host for other purposes. You specify the local location as well as where you want the file on the docker image. Pretty simple. So that’s just a taste of the available commands and examples of them but it’s all we need for our example at this point. So let’s build an example docker file so we can see how powerful this is. Here I’m telling the docker file which image to use as a base image. If you attempt to build the image without having the specified base image already on the host, docker will download it for you. Secondly, I’m putting a brief comment in about who created and owns the image. I need the EPEL repo for some of the stuff I want to install. Namely Supervisor. Supervisor (process is named supervisord) is a process control system written for Linux. Essentially, it’s what allows us to run and maintain multiple processes in the docker container. So this is pretty straight forward. First we tell the supervisord process to not run as a daemon since it needs to run in the foreground of the container. If it doesn’t, then the container will run the process once and then quit because it completed running it. Next we specify the apps we want to run and also indicate that we want them run in the foreground for the same reason. Since I’m once again building this image to impress my friend Bob, I want to have a super cool index page that apache uses when I spin up the image, I’ll load it in during image creation. Since this is a brand new host, we need to do all of the normal stuff to setup SSH. I’m hoping that some of this (besides the key creation) can get added into the base image at some point to make this easier. I set the root password so I can login. I’m sure there are better and more secure ways to do this but I do it this way here just to prove that SSH works. These are the ports I want to expose to my end host. If I list them here in the docker file I can just pass the ‘–P’ flag to docker during build and it will automatically use these ports rather than having me specify them. The downside is that I cant specify a host port with the expose command, only the destination port. More on this later. As we already discussed, I need to do this to keep the container running with multiple processes. Wohah! That’s a lot of images! You can see after the base image of centos:latest that we have 15 user images! Looking back our docker file we can see that we had 15 executable lines without the last CMD command. 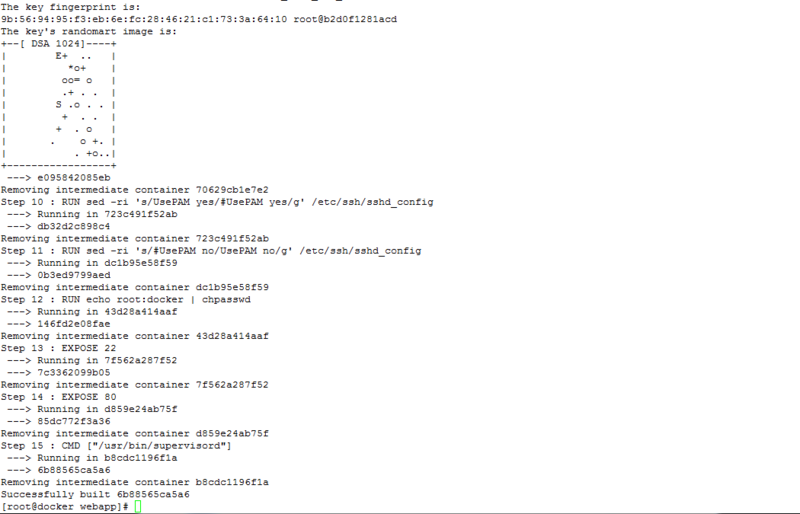 So docker creates a image for each line in the docker file with the exception of the CMD line. You can see that if you had an extensively long docker file how this might get out of hand. Hopefully at some point, there will be a way to squash the user images together while maintaining the base image. Looking at the container, we can see that docker has mapped port 22 on the container to port 49159 on the physical host. Additionally, port 80 on the container has been mapped to port 49160 on the physical host. So let’s test this out and see how it works! There it is, you can now see Bob’s awesome home page! Note that if you were to stop the supervisord process through the SSH connection, the container would quit. And let’s check the webpage quick.. So as we can see, the docker file is a much more portable option then sending entire image stacks when sharing information. Docker files appear to be the best way to build images at this point but I’ll say again that I think being able to squash user images together would be very beneficial. Creating a new image every time a command in the file is run can get huge pretty quick.